New Time and New Venue - - Starting September 16, 2018 all the Freewheelers' dances have been moved to the Cedar Valley Grange, address above. Additionally, we are starting our dances with pre-rounds at 6:30 - 7:00 followed by a dance to 9:30 with alternating squares and rounds. We've eliminated the meal break, instead there will be open refreshments during the dance and a quick pause for short announcements for upcoming dances, door prize and spilt-the pot. New Student Dance - - Twice a year the mainstream dance will be called at floor level for new dancer. Watch website for information on next level dance. 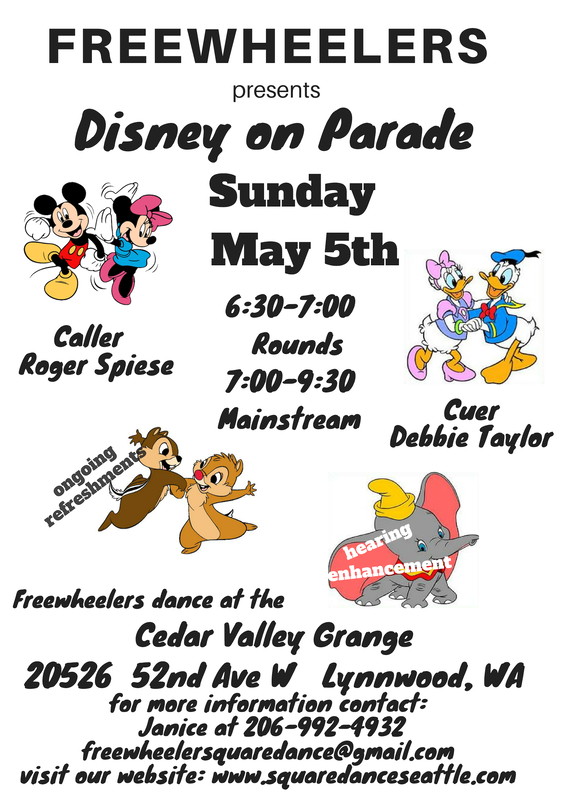 Spyder Webb will call, Debbie Taylor is cueing and an Experienced Clothing Sale is in the basement! Check the Schedule tab for updates on dance information. ​See the Directions tab to find the fun.